Kwikwetlem First Nation Councillor Fred Hulbert gives formal welcome and prayer to guests for the overpass announcement celebration. 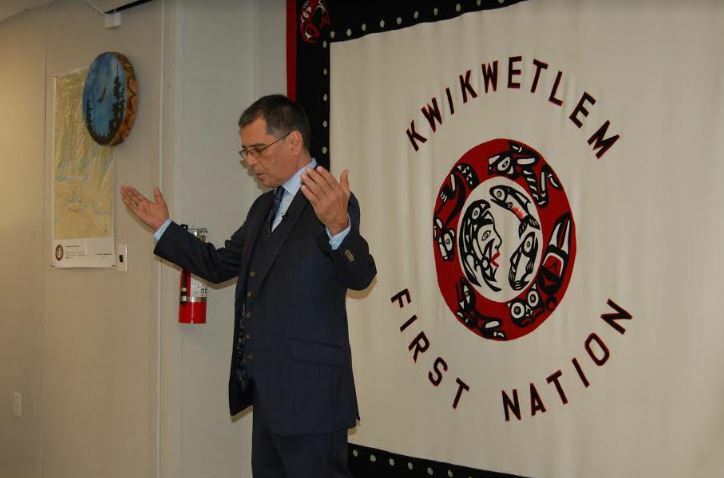 Kwikwetlem First Nation (KFN) recently hosted a celebration to thank federal, provincial and local government and business representatives for their support of the Colony Farm Road and Pitt River Road overpasses project. 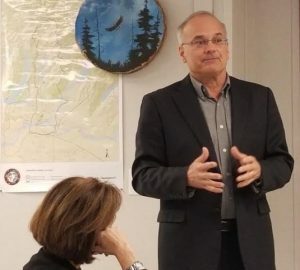 Earlier this year the federal government announced funding for several transportation improvement projects in Metro Vancouver. 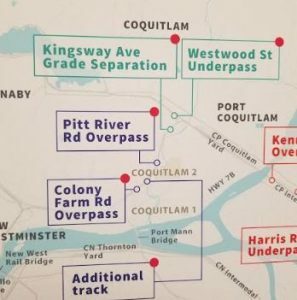 The announcement included funding for the design phase of the Colony Farm and Pitt River Road overpasses project. Current access to both roads from Lougheed Highway requires crossing the CP rail tracks. Traffic is halted when a train is using the tracks near both roads. The overpasses would eliminate this situation and improve safety and access. KFN says the overpass on Colony Farm Road is required to improve access to IR1 which is home to KFN’s community of approximately 60 people. 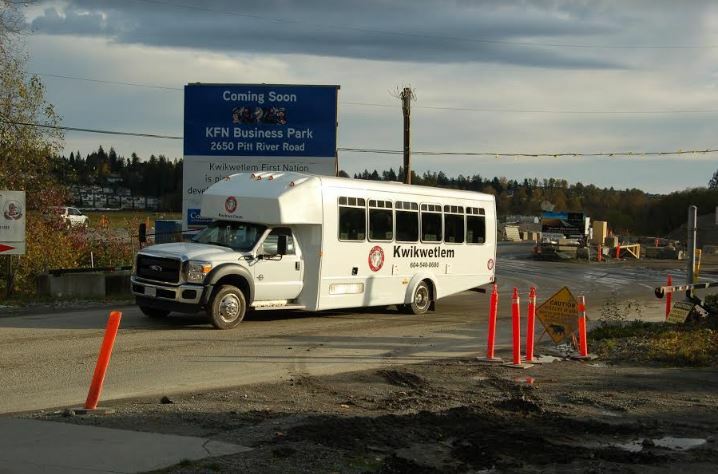 The overpass on Pitt River Road is required for access to IR2 which is home to the Kwikwetlem Business Park, currently under construction. Part of the celebration event included a bus tour of the Business Park. 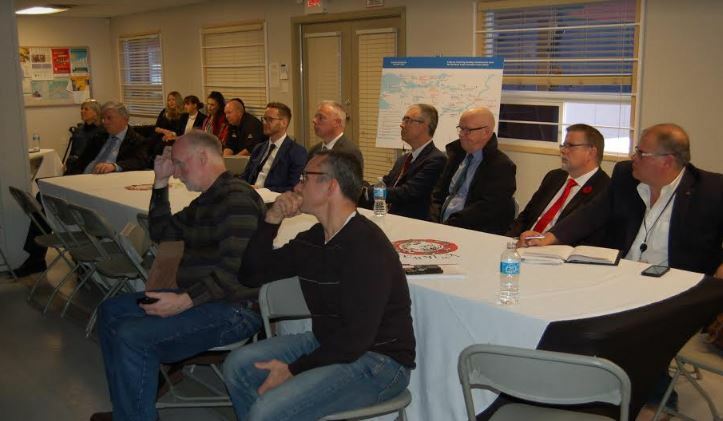 Guests watched a variety of presentations on the impact of the new overpasses as well as a new integrated health centre planned for the business park. 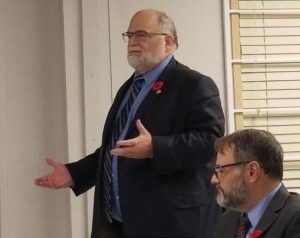 Politicians in attendance included MPs Ron McKinnon and Dan Ruimy, MLA Selena Robinson, Coquitlam Mayor Richard Stewart and Councillors Dennis Marsden, Chris Wilson, Craig Hodge and Brent Asmundson. There were also representatives from a variety of organizations including the Tri-Cities Chamber, CPR and Vancouver Fraser Port Authority.